The stories about the operations and missions that they told Judith, took place in: USA, Russia, Jordania, Israel and Europe – in Great Britain, Austria, Germany, France, Belgium, Luxembourg, the Netherlands, Italy, Portugal, Slovakia, Hungary and Lithuania. In this book Judith describes not only the most dangerous operations, she gives also an introduction to the selection process, the formation and the psychological training of these elite fighters. She describes also how they go along with every use of their physical and mental limits and how they deal with traumatic experiences. The author collected in this book exciting and moving reports of the members of the units from various interventions over the past decade, including the tragic events of January 2015 in France, which began with the attack at the offices of Charlie Hebdo-newspaper. „Fighting the War on Terror“ has been written in a Reportage-Style. 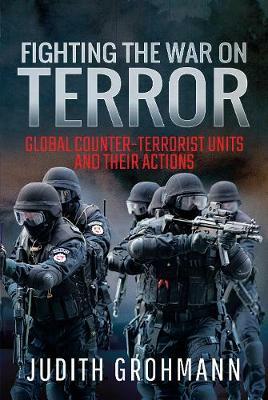 This book has known a great success, because Judith is worldwide the first author being introduced into the World of active Counter Terrorist-units. Judith gives her readers a look behind the curtain of the work of these courageous men and women in these units, who fight every day against Terrorism and Crime to guaranty with their own life the Security of the citizens. Judith dedicated this book to the American actor Kevin Spacey, because, after watching his performance of police Lieutenant Chris Sabian in the movie „The Negotiator“ in 1998, she became extremely interested in the topic of security and the work of Counter-Terrorist-Units. Fighting the war on Terror will be published in November of this year 2018. Pre-order starts in September 2018. At Barnes&Noble, a Fortune 500-company, is the bookseller with the largest number of retail outlets in the United States, and a retailer of content, digital media, and educational products. As of October 15, 2017, the company operates 633 retail stores in all 50 US states. At BAM- Books-a-Million, which has grown to become the premier book retailing chain in the Southeastern United States, and the second largest book retailer in the nation. Based in Birmingham, Alabama, the company currently operates more than 260 stores in 32 states and the District of Columbia. At Booktopia, is an Australian online bookstore, who has been elected „Bookstore of the Year“.